Zoom Zoom! 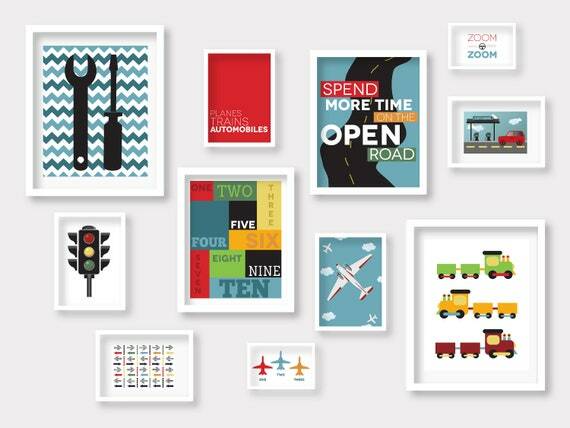 Start your engines with our Transportation themed gallery wall for a little boys room. This set is perfect for the little boy who just can't put his matchbox cars down. We've packaged some of our most popular nursery prints into a fun gallery wall set up to make decorating a little bit easier. This listing includes 11 DIGITAL High Resolution JPEG files for you to print. Prints will be emailed to the etsy address on file unless you specify otherwise. Does not include frame/matting, digital prints only. Item will be emailed to you within 3 business days depending on how much customizing needs to be done. If you would like to purchase one of the prints outside of the set, convo us and we can set up a reserved order.